The transitional style of the Sierra Counter Height table will carry throughout your kitchen, dining, or home pub area. Crafted of metal and highlighted with beautiful faux marble top, this contemporary table is a striking addition to your home. This table is elegant and versatile, works well in your modern apartment or industrial loft, making it the perfect choice for any gathering area. 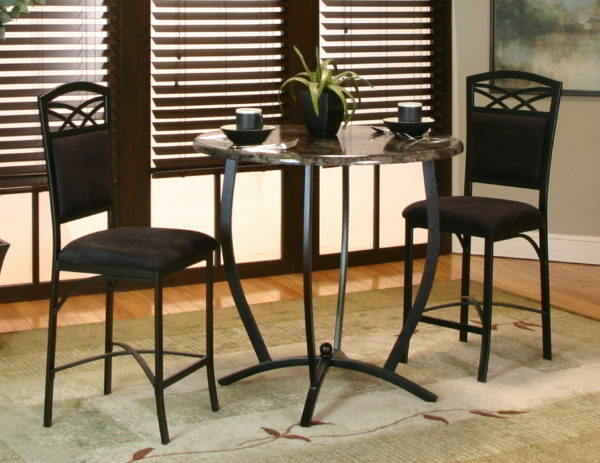 Pair with matching Sierra barstools for an ideal small dining setting. *Care: Wipe metal surfaces with damp, soft cloth. Harsh detergents, chemicals abrasives and solvents will damage the finish.